Three years ago our lives were turned upside down. What was supposed to be a routine well-child appointment with minor concerns about a few weird symptoms turned into a three-day hospitalization and a T1D diagnosis. But here we are, three years later, thriving. Going into this anniversary, I was feeling some sadness and was fully prepared to blog about it. But as I sit today typing this post, the primary feeling is that of gratitude – for excellent care V receives, the resources and tools we have to manage diabetes, the support of our family and friends, and the amazing resilience V has shown from day one. Our first diaversary was a non-event because we were busy with life, which is a good thing! We made up for it last year by having a more elaborate celebration. Today we had plans to go out for breakfast so that V could load up on her favorite pancakes. Alas, both me and my son were sidelined by a nasty cold. Hubby took V out for a quick father-daughter date of yogurt and park instead. Here is to three years of living well with diabetes, and to many many more ahead! I am not the most organized person, to put it gently. But now we have too much diabetes paraphernalia and it has to be organized somehow. Below are some of my favorite things that help me keep diabetes stuff more organized less disorganized. This Lazy Susan office supply organizer is great for keeping lots of diabetes things in one place. It holds our wipes, lancets, strips, tape and more. It can hold infusion sets but it’s a tight fit for pods a tad too small for Dexcom sensors. I can jam a few in but it’s not really worth it, so we keep those separately. Someone on my local T1D Facebook page recommended this organizer and it’s worked great for us. Here is it on Amazon for $22, not too bad. It took some trial and error to figure out how to carry our back-up supplies. We are often on the go and there have been many times we had to change a pod unexpectedly, or check for ketones, or fix/attach/detach/mcgyver something, so we need to carry lots of crap with us. We tried different baggies and cases but nothing really worked. Then one day I saw one of my fellow D-Mom friends (or, as Katy brilliantly recommends, a D-Unit) with this little medical case. I ran, not walked – RAN – to Target to buy it. Best $5 purchase ever. It changed my life. On the outside, it’s a perfect size, unassuming, yet its purpose is clear, it zips closed so that nothing falls out, it has a handy handle and even a touch of pizzazz. On the inside, it is roomy and functional, has different compartments (BTW I think I have a borderline unhealthy love for compartments and zipped pockets), and fits all our necessary backup stuff: insulin, syringes, pods, wipes, ketone meter, glucagon, extra strips, scissors, batteries, and more. Everything has its place and stays put. Loooooove. Last but not least, this beauty, along with the PDM, Dexcom receiver, and a couple of gluten-free snacks, goes inside a small backpack, which we refer to as Diabetes Kit. It’s usually V’s responsibility to pack it and wear it. We don’t leave home without it. At least in theory. We may have accidentally left it behind once or twice or thirty million times. By the way, the front pocket is where we keep fast acting sugars, for quick and easy access. I had a blast writing these Diabetes Blog Week posts. Don’t forget to check other people’s posts here. We are very, very lucky. Our healthcare experience has been overwhelmingly good. We have a wonderful pediatrician who was instrumental in V getting promptly and accurately diagnosed with T1D. Our children’s hospital is outstanding and we received excellent care, support and education when V was hospitalized at diagnosis. V’s Endocrinologist rocks our socks. She listens, does not rush through appointments, answers all our questions, and treats us as equal team members. The Endo clinic has two dedicated pump nurses who are very knowledgeable, experienced, efficient and kind. We have very good insurance through my husband and so far experienced minimal barriers or delays in getting the supplies V needs. The lack of understanding of T1D by many health care professionals (HCPs) outside of diabetes specialists that we encountered is appalling. So many providers have no clue. Like this very nice nurse as CVS clinic, who treated V not long ago for an ear infection. She was trying to assess if V’s BG had been over 200 that day. I’m pretty sure she was just following the protocol. I tried to politely explain that 1. It’s an extremely lucky day if V’s BG does not go over 200 at some point, and it’s totally normal, and 2. When she’s sick, her BG will run high no matter how aggressively we try to treat it. She told us that if her BG does not come down in a few hours we will need to go to the ER. Umm…No. Seeing that I was not going to agree to this plan, she stood down a little: “If it’s still over 200 in 3 hrs, you will call your doctor, OK?” I said “sure” just to end the conversation, and can we please deal with V’s ear infection now, thankyouverymuch? The initial expense of diabetes – the hospital copay, ALL the insulin and supplies at once, a million appointments in the early days, and pump and CGM copays a few months down the road – was a royal bitchslap to our finances. The year of diagnosis we reached the out-of-pocked maximum for the first time ever. The cost of insulin and test strips is absurd, even with our very good insurance. Between all necessary supplies, labs and quarterly Endo appointments, we spend a lot of $ on diabetes every year. But once again, we are lucky and privileged. We have good jobs and good insurance coverage. We can manage. Other people are not so lucky. How is it that some people have to ration insulin because they cannot afford it? Or not have access to life-saving CGM because Medicare and Medical do not cover it? Or have constant battles with insurance because of ridiculous denials, delays, and screw-ups? It breaks my heart to hear stories about people’s struggles with diabetes because they do not have access to affordable, quality healthcare. It infuriates me when insurance companies create barriers to care and access and make medical decisions based on cost vs. scientific evidence and doctors’ recommendations. Nothing gets my blood boiling more than seeing companies put profit over patients’ health, and sometimes over their lives. Non-diabetes healthcare providers: Please educate yourselves about T1D and the difference between Type 1 and Type 2. Basic knowledge will suffice, really. When you know about signs and symptoms of T1D and DKA, you can save lives. And if you don’t know much about T1D, please don’t tell us what to do. We can sort it out with our diabetes management team. Also, you need to trust our knowledge and expertise. Chances are we know a lot more about T1D than you do. Insulin-makers: Get a grip on the cost of insulin. Yes, we understand you need to make money and make your shareholders happy. But you are holding hostage people who cannot live without the medication you make. And your profits keep going up while insulin costs are going up and people’s out-of-pockets costs are going up. There can be a better balance. Curb your greed! Insurance companies: Don’t try to pretend that you are in it for our health. We are not stupid. But just like drug-makers, there can be a better balance between your need for profit and our need for care and access. Do not make medical decisions or deny access to coverage because you don’t deem it medically necessary – it’s up to our doctors to decide! Medicare and Medical: COVER CGM. It is not only medically necessary, it can be life-saving, especially for seniors and children who are particularly vulnerable to dangerous highs and lows. In the long run, everyone benefits from being healthy. There are so many words and phrases surrounding diabetes that can evoke a strong response. Where to even begin to describe some of mine? Coincidentally, I weighed in on what I think about “diabetic” in one of last year’s Diabetes Blog Week Posts. The short of it is, it’s OK, it does not bother me in the slightest. I could talk about “compliance”. That’s one word that does not make me – and many others – feel warm and fuzzy, especially when it’s used by healthcare professionals to slap a negative judgment without making any efforts to understand why their patient is struggling. That’s right. I am totally serious. I have a very complicated relationship with that word. There is a part of me that is simply sick and tired of hearing it. Diabetes, shmiabites… How often do I hear it every day? How often do I say it myself? Diabetes brings me no joy and saying/seeing/hearing it is no exception. When I don’t say it out-loud, I think it. Diabetesdiabetesdiabetesdiabetesdiabetes… Sometimes it’s just a slightly annoying white noise; other times it’s like a swarm of angry wasps. Can I please have a day without saying, hearing or seeing the word? Often, when I hear the word “diabetes” uttered by a stranger, I recoil. What’s going to come next? A mean-spirited joke? A deluge of misinformation? A judgment? An unsolicited advice? It immediately puts me on a defense. Do I say something? Do I let it go? Then there is a hassle aspect of it. You can’t just say “My daughter has diabetes” and leave it at that. It’s not like “she has hazel eyes”, or “she is 11 years old”. Once the word “diabetes” comes out of my mouth, some version of an elevator speech must follow. There are times I don’t mind. And there are times I absolutely cannot stand it. I can feel anywhere from annoyed to exhausted, depending on what’s going on. Yet, there are times when, upon hearing “diabetes”, my ears perk up and my heart skips a beat, in a good way. It usually happens when I’m with my T1D tribe, or when I meet a new diabetic/family, or when a person who’s addressing me clearly knows what they are talking about. When a stranger at Costco notices my daughter’s pump or CGM and asks if she has diabetes, it’s a good sign! The word becomes a symbol of connection, unity and understanding. Bring it on! And then, when I am particularly mad at diabetes the thing, I call it “diabeetus”. No matter what is going on, calling diabetes “diabeetus” makes me chuckle. As soon as I can laugh at it, it’s a battle half-won. Emotions. There are so many emotions surrounding diabetes. Her feelings. Our feelings. The feelings of everyone involved. Mental and emotional aspects of diabetes are tough, maybe even tougher than physical aspects. Because you get used to blood, and needles, and finger pokes, and bionic parts, and beeping. And, come to think of it, it’s more visible, more tangible, more straightforward. The emotional stuff is trickier, harder to notice, harder to understand. Lots has been said about stress and burnout of T1D parents. I’ve written several posts about it before. When we are on our best behavior, we handle well. So much so that I wrote a column for Insulin Nation on tips and tricks on handling burnout. But enough about us. Let’s talk about V. While she’s generally a rock star and takes it in stride with remarkable resiliency, humor and optimism, it’s not always easy. What makes it even more complicated is that in addition to managing emotions about diabetes, she has to manage emotions directly caused by diabetes. I remember how several weeks leading up to V’s diagnosis we noticed that she became really emotionally volatile. There would be meltdowns seemingly out of the blue, over-blown reactions to minor things. She’d be sent to her room, raging and sobbing, acting and feeling completely out of control. My husband and I watched in bewilderment. What was going on? Was this a preview of what is to come in adolescence? But she’s only 8 years old, how can it be? But then I’d talk to some friends and they would share how their daughters sometimes acted the same way. So maybe it’s normal girl drama? But V was fairly even-keeled before. Something did not make sense. We’d talk to her, trying to help her manage her feelings and behaviors. What is going on? We just want to understand so that we can help you. She could not explain. She’d be sobbing and telling us that she did not know why she was so upset or angry, and that she could not control it. It was especially bad around mealtimes. Suddenly hunger became intolerable, an almost certain trigger for an epic emotional meltdown. T1D explained it all. V’s undiagnosed BG swings created tsunamis of mood swings. Highs translated into intense and uncontrollable rage with a generous side of strong upset. Lows brought out the whining, complaining and crying at the drop of a hat. But at least now we knew what was going on and we felt more empowered to handle it. Not that it’s straightforward. How do you tell a difference between a “high angry” or “regular angry”? How do you know when the tears come from feeling beat and tired due to a stubborn high or low, or due to some unrelated upsetting event? How do you tell “hangry” from bad attitude? How do you know when to hug and comfort your child or when to discipline her for talking back or lashing out? Helping a T1D child manage her emotions requires us to rely heavily on trained intuition. If something feels amiss we must first rule out BG as the culprit. “When in doubt, test BG” is our go-to motto. Another one we had to adapt quickly is “Don’t make decisions when you are high.” Closely related is “Don’t try to deal with a conflict when you are high.” And there’s always the good old “FOR CRYING OUT-LOUD DON’T JUST SIT THERE, TAKE A FAST ACTING SUGAR!! !” Wait, that’s not a strategy, it’s our own reaction. Because you know what, when you are a parent operating in an exhausted and sleep deprived mode, sometimes the last thing you want to do is be in tune with your child’s emotions. You just want your child to listen, comply and “act normally”. As you may have guessed, this does not work out well. In some ways things have settled down a lot since diagnosis. Now that V’s BG is more tightly controlled, these meltdowns are far less frequent. Her emotional reactions are still very much affected by highs and lows but we all spot and understand them better. In other ways, things are getting more…well…interesting. Puberty is fast approaching and that emotional volatility is inching up regardless of what diabetes is doing. It’s for all of us to figure out. Even in V’s 504 there is a line addressing behavioral aspects of diabetes, and instructions to test BG if V’s behavior appears out of character before considering any disciplinary actions. The roller-coaster continues. Strap yourselves in, it’s one hell of a ride. 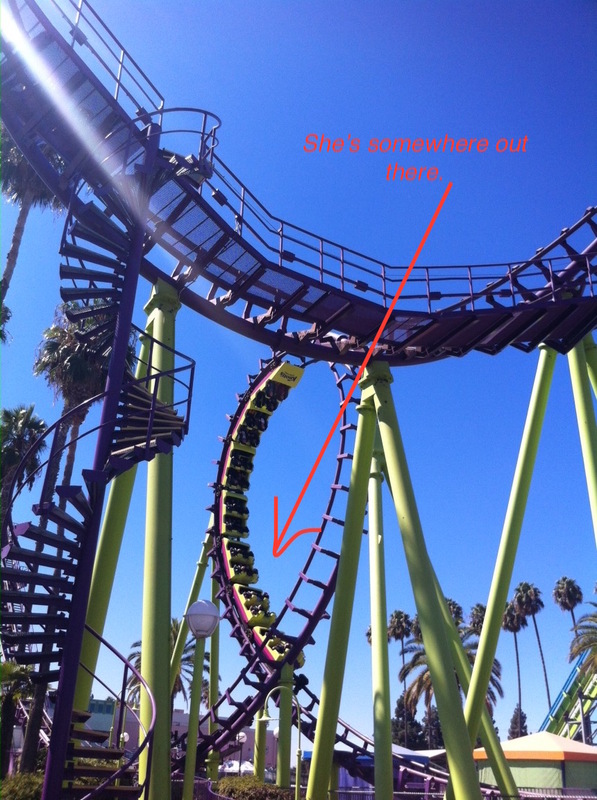 The only roller-coasters I approve off. The main idea for Diabetes Blog Week is that bloggers sign up to post about a set topic each day for a week. This way, readers can jump around the DBlog Community and get a big variety of different perspectives on a single topic. The hope is that new DOC connections are made, and that our voices are raised to spread a little more diabetes awareness. You can preview all of the topics here and check a list of all participants here. I encourage you to check out other people’s blogs. There are lots of really awesome people with really great blogs out there. Moving along, today’s topic is Message Monday. Lets kick off the week by talking about why we are here, in the diabetes blog space. What is the most important diabetes awareness message to you? Why is that message important for you, and what are you trying to accomplish by sharing it on your blog? Your child just won a diagnosis of type 1 diabetes and celiac. What are you going to do next?! Forget about Disneyland. I’m starting a blog! If you are old enough you may understand the reference. I’ve been itching to start blogging as soon as V was diagnosed in May 2013. But I decided to wait until getting a conclusive diagnosis of celiac, which happened in August 2013. I had this blog’s name all figured out and some ideas of what to write about. As soon as celiac diagnosis became official, this blog was launched. When I just started out, writing here was almost a necessity. More than anything, I needed a place for me to sort out my thoughts and feelings about our T1D and gluten-free life. I knew we were not alone in our lovely predicament and we connected with a number of local T1D families pretty quickly after diagnosis. However, I also earned to connect to more people, especially those dealing with both T1D and celiac. Blogging was one way to reach out to others. Gradually, this blog also became a vehicle for spreading awareness and advocacy. By sharing our journey, I hope that more people learn about T1D and celiac, all of the good, bad and ugly that comes with living with it. And the more people are aware and understanding, the friendlier this world is for my daughter and her pancreas and gluten challenged counterparts. As to the message, when I was thinking about writing this post I really struggled to identify something specific, aside from just being honest about our experience. But then I remembered something a nurse told us at the hospital on the day V was diagnosed: you have to figure out how to fit diabetes into your life, not the other vay around. This was probably the most important message we heard and it stuck with us. V’s diabetes (and celiac) management revolves around her life and her goals. We are determined to not let T1D or celiac stop V from living a normal life and doing what she loves. Yesterday the diabetes online community (DOC) became abuzz with the news that effective July 1st, United Healthcare (UHC) was partnering with Medtronic as their ONLY in-network insulin pump brand. While people who are using other pumps still on warranty would be covered until that warranty expired, and the change does not apply to pediatric patients, this is a significant restriction of choice. Many people wrote eloquently about numerous implication of this collusion. Here is a comprehensive coverage of the news and reaction from DOC. This new change does not affect us directly. We are not using Medtronic pump and our insurance is not through United Healthcare. But we are affected nevertheless and I’m about to unleash my emotions here. I.AM.ANGRY. And also a little scared. I am angry that UHC and Medtronic colluded to restrict patient choices in the name of profit. They say it’s for patients’ own good but come on, really? We are not stupid. Whenever did restricting choice and access improve outcomes? Access and choice are not luxury, they are necessity. Diabetes is damn difficult to manage and no insulin pump is created equal. People have good reasons to pick one pump over another. It may be due to integration of Continuous Blood Glucose Monitoring (CGM) with the pump, or ease of using it, or amount of insulin it can store, or possibility smaller incremental delivery of insulin, or pump being waterproof. For example, we chose OmniPod partially because our daughter is very active and we did not want to deal with tubing and disconnect for physical activities. This proved to be a very wise decision. Turns out that discontinuing background insulin (which is what happens when one needs to disconnect form the pump) has a drastic effect on increasing V’s BG. I am angry that the two companies made the decision in the name of patient outcomes without consulting with patients and doctors. Of course I don’t buy that line of “we are doing it for your own good.” And yet, if they claim to be listening to patients, how is their decision reflective of what patients need? I am angry on behalf of all people who will soon be directly affected by this decision. People who have to give up the pumps they use and love for the one that may not be right for them. People who may have worse outcomes because of this change. People who will have to endure yet another fight with their insurance company to meet their needs. I am angry specifically at Medtronic for entering into this deal with UHC. I would expect this from an insurance company. But from a company that is supposedly working to help diabetics improve outcomes and quality of life? It feels like a low blow and a serious breach of trust. I am angry of how this decision makes an already difficult and frustrating disease even more difficult and frustrating to manage. I am scared of how this sets up an ugly precedent. Which other insurance companies will follow suit? Which other pump manufacturers will jump on the bandwagon? Are we next? I am scared of what this will mean a few years down the road in terms of innovation. Will other companies be driven out of business? Will this impede collaboration between different companies in their joint effort to bring better tools and technology? I am scared of what this will mean a few years down the road in terms of Artificial Pancreas technology. Will our daughter be able to choose based on her needs? Will there even be more than one choice? I am angry and scared. And I am energized. I stand with all those who are immediately affected by UHC/Medtronic collusion and with everyone else in the diabetes community who believe that a major line was crossed. We will fight this and we won’t go down quietly.